If you're in Montreal and you want to shake some of that winter blues, than you can for at least a few hours during this week end at the 6th annual Montreal Bike Show at place Bonaventure. Here's the press release for the full low down. Montreal, February 4, 2008 – Calling all cycling enthusiasts! The Bicycle Show Expodium is taking place this February 15 to 17 at Montreal’s Place Bonaventure. Now entering its 6th year, the Show is back and better than ever - with an exciting program that’s sure to thrill cycling enthusiasts of all ages. Even the most discriminating connoisseurs will be impressed! Come and explore cycling and its unique sense of freedom! The 6th Bicycle Show Expodium is the place to find information, compare, shop and dream, thanks to family activities, unexpected shows, the largest cyclotourism section ever seen in Canada, a 200-metre long test track and over 200 exhibitors and experts on-site to answer all your questions. The annual Bicycle Show Expodium is much-awaited by all cyclists eager to learn more about the latest products and trends, as well as what’s new in cycling destinations. It is the only show in Quebec dedicated exclusively to bicycles and the tremendously popular field of cyclotourism. During the 2007 Show, more than 16,000 cycling enthusiasts descended from all over Quebec to explore the Show’s exhibits and to learn more about this wonderful world on wheels! This event brings together under one friendly, easy-to-access roof, all the key players in this rapid-growth industry, along with those involved in the many areas related to cycling - be it for sport or recreation. This combination gives visitors a unique “close-up” look at all the top products and services available on the market. The Bicycle Show Expodium understands the importance of cycling as a family. On Sunday, February 17, children ages 12 years and younger enjoy free admission to the Show when accompanied by a parent. It’s a family event that’s not to be missed! At the Zone Exposants, exhibitors will be showing off a full range of cycling-related products and services, including training, nutrition, etc. Over 200 exhibitors and experts are ready to answer all your questions! The Zone des Spectacles is home to a series of live presentations. To usher in a new Olympic event for the upcoming 2008 Summer Games, the Bicycle Show Expodium is proud to present a special BMX show by the Haro/Adidas Eyewear stunt team that’s sure to raise some hair and chill a few spines! The Show is also bringing back fashion shows featuring the latest in cycling wear from KSL, a company headed by 2002 Canadian road champion Katy St-Laurent. The Théâtre du Vélo La Presse is sure to attract large crowds to its 20+ conferences. There, specialists will share in-depth information on techniques, positioning, performance, conditioning and nutrition. One of the most-awaited conferences this year will be from the Université de Sherbrooke VéLUS research group, which will offer exciting new findings sure to shape the cycling of tomorrow. One researcher will provide an overview of past and on-going projects that touch upon every cyclist’s top three concerns: safety, comfort and performance. Also on the program, a nutritionist from Sherbrooke’s Centre d’excellence sportive will discuss nutrition for cyclists and the ever-growing availability of dietary supplements. The Zone Cyclotourisme is the largest cyclotourism section ever to be seen in Canada, featuring more than 130 cycling travel packages in over 30 countries. Visitors to this zone will also discover the top cycling circuits in Quebec for family outings, romantic excursions or athletic pursuits. Quebec’s strong reputation as a popular travel destination in recent years is highlighted, thanks to the development of the Route Verte, a province-wide cycling network of over 4,000 kilometres of trails. Several Quebec regions will be in attendance, eager to woo cycling enthusiasts with tourism information such as main attractions, bike paths, accommodations and road circuits. Everything you need to plan a cycling-filled summer! The Théâtre du cyclotourisme offers conferences on the latest trends in cycling travel destinations, including an introduction and exploration of cyclotourism itself - be it solo, in a group or with the family. Conferences will also cover various cycling circuits both here in Quebec and around the world. Yvan Martineau will be one of the main presenters. This journalist and creator of the French-language show “Dans la roue du tour” is an avid cyclist, stemming from his many challenges along the legendary Tour de France. Yvan will discuss Europe’s most exhilarating circuits, along with a presentation that follows a typical day with a cyclotourism club - a booming trend in Quebec. The Expodium even includes an indoor marked path of nearly 200 metres in length to give visitors a first-hand chance to test the handling, flexibility, braking, comfort and suspension of various bikes made available by exhibitors. 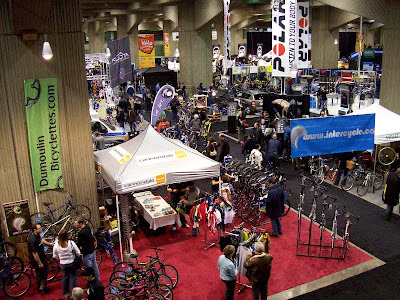 The 6th Bicycle Show Expodium, held at Montreal’s Place Bonaventure from February 15 to 17, 2008, is presented in collaboration with La Presse, TQS and the Fédération québécoise des sports cyclistes. Visit the Show’s website at www.expodium.ca to learn more about the event’s programs and scheduled activities. New Diet Taps into Pioneering Idea to Help Dieters Get Rid Of 20 Pounds within Just 21 Days! WHAT'S GOING ON WITH THIS BLOG?